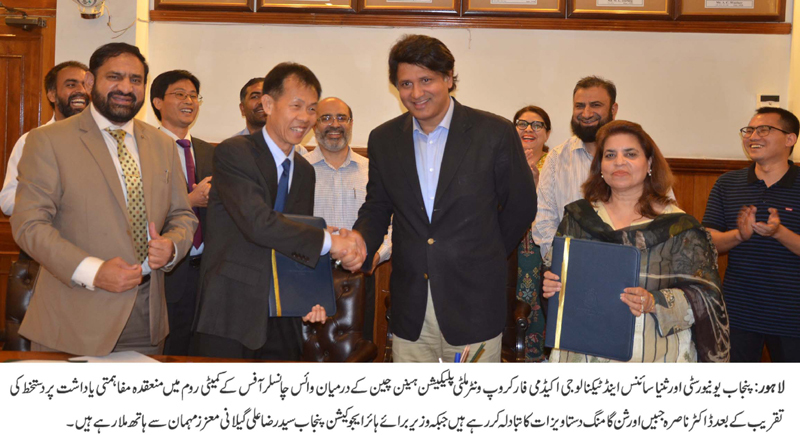 LAHORE: (Monday, May 14, 2018): Punjab University and Sanya Science and Technology Academy for Crop Winter Multiplication Hainan, China have signed a memorandum of understanding to promote cooperation and exchange on tropical agricultural science, modern agricultural technology, genetics and breeding, processing of agricultural products and other fields. In this regard, and MoU signing ceremony was held at committee room of Vice Chancellor’s office. Punjab Minister for Higher Education Syed Raza Ali Gillani, PU Vice Chancellor Prof Dr Nasira Jabeen, Sanya Science Academy Director Chen Guanming, Registrar Dr Muhammad Khalid Khan, Director External Linkages Dr Fauzia Hadi Ali, Institute of Agricultural Sciences’ Director Prof Dr Saleem Haider and others were present on the occasion. Addressing the ceremony, Syed Raza Ali Gilani said that Pakistan and China were enjoying the best relationship and both were time tested friends. He said that the academic institutions of both the countries must promote bilateral relations and initiate joint research projects. According to MoU, both the organizations would extend cooperation in the field of new and high technology industries of both sides and would work for achieving several targets for the development of agriculture sector. Both organizations arrange exchange of visits of researchers, students and managers of the institutions and would coordinate science and technology investment, project and technology promotion. PU and Sanya Science Academy would also jointly organize activities like professional trainings, technical lectures, joint international seminars, technology and policy advisory.